Here is a selection of images of the Icehotel in Jukkasjärvi, Sweden, including the Art Suites created by artists from around the world. 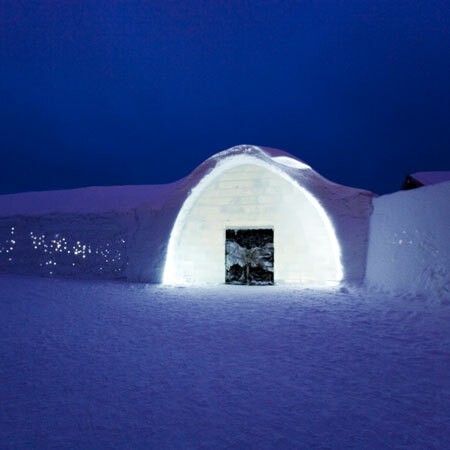 The temporary hotel is created from snow and ice each winter. The dropping of the temperature to several degrees below zero in Jukkasjärvi marks the start of an ephemeral art endeavour. Using only frozen water form the Torne River, artists from all over the world gather in this small Swedish village, 200 km north of the Arctic Circle, to create an exclusive art exhibition: ICEHOTEL in Jukkasjärvi. Above: Reception - Changes. Artist/s: Jens Thoms Ivarsson & Mats Nilsson. "The permanency of change is what inspires us – our feelings, perceptions and actions are driven by the transformations all around us. Change… is forever." Photographer: Ben Nilsson/Big Ben Productions. Above: Main Hall - Mellanrum: Mind the Gap. Artist/s: Lena Kriström Kulin. "Mellanrum: Mind the Gap is a mood-enhancing voyage that draws visitors down the center of the massive corridor, passing carefully crafted figurative faces, each with a different design and mood." Photographer: Ben Nilsson/Big Ben Productions. Above: Ice Church: Kristall. Artist/s: Mark Szulgit, Julia Orlando Adzuki, Marjolein Vonk & Cindy Berg. "The 2007-2008 Ice Church pays tribute to the graceful little building block that is the basis for the entire structure itself – the snowflake. The symmetry of the snowflake is seen in the church itself, its balance and openness creating an inviting atmosphere for contemplation." Photographer: Ben Nilsson/Big Ben Productions. Above: Art Suite 313 - The Forest Suite. Artist/s: Andrea Thomson. "Leave the ICEHOTEL corridor behind you and step into a celebration of the lofty pine and spruce woods that characterize the landscape of northern Sweden." Photographer: Ben Nilsson/Big Ben Productions. Above: Art Suite 306 - Crystallization. Artist/s: Patrick Dallard. "Charting the geometric voyage from chaos to order and back to chaos again, previously unperceived beauty is unleashed in a constellation of ice and snow." Photographer: Ben Nilsson/Big Ben Productions. Above: Art Suite 304 - Snow Aurora Borealis. Artist/s: Kestutis Musteikis & Vytautas Musteikis. "During the darkness of an Arctic winter, it is the aurora borealis that offers hope and promise by adding vivid brushstrokes to a cold, black canvas." Photographer: Ben Nilsson/Big Ben Productions.